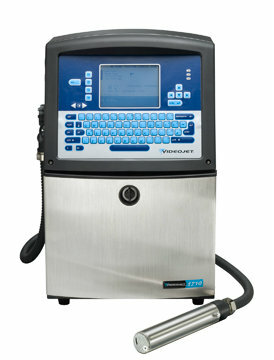 For applications that require easily readable variable data codes on dark or difficult to mark materials, Videojet Technologies Inc. has designed the Videojet 1710 small character continuous ink jet printer. The printer uses high-contrast, pigmented inks to create bright, clean codes on surfaces for which dye-based inks are not effective, such as colored glass, rubber tubing, plastic cabling and dark paperboard. It is capable of printing a variety of fonts in multiple languages, as well as linear bar codes, 2D DataMatrix codes, custom logos and graphics.For applications that require easily readable variable data codes on dark or difficult to mark materials, Videojet Technologies Inc. has designed the Videojet 1710 small character continuous ink jet printer. The printer uses high-contrast, pigmented inks to create bright, clean codes on surfaces for which dye-based inks are not effective, such as colored glass, rubber tubing, plastic cabling and dark paperboard. It is capable of printing a variety of fonts in multiple languages, as well as linear bar codes, 2D DataMatrix codes, custom logos and graphics.